To mark its recent meeting in Hong Kong, the World Bank published a report China 2020. 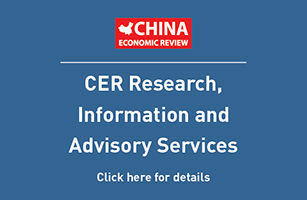 The report covers China's economic achievements over the last 18 years ?one of the world's highest rates of growth and a successful start to the transition from a command to a market economy. These achievements have been brought about by step-by-step implementation of re-form principles rather than a wholesale scrapping of its old economic structures. Mr Richard Newfarmer, the World Bank's lead economist on China, commented that "gradualism has been a hall-mark of past Chinese success". The report looks forward to continued growth and focuses on the policies needed for completion of China's transition to a vibrant modern economy. The report forecasts that, with these policies, China by 2020 will have the second largest economy in the world, after the US. Its average per capita GDP would put it into the ranks of middle-income countries. GDP growth would average 6.6 per cent a year, declining from 8.4 per cent over the next three years to five per cent in 2020. The reasons for the decline are the slowdown in the increase of the workforce, diminishing returns on increments of capital and completion of the transfer of labour from agriculture to industry. In addition, China would have narrowed its technology gap with other countries, reducing the scope for one-shot productivity gains. Many of the World Bank's recommended policies are already in the process of being adopted. For example, an estimated 90 per cent of Heilongjiang's state-owned enter-prises have already been turned into some other form of company. How-ever, the successful implementation of China's reforms is not guaranteed. The World Bank sees the process threatened by the continued survival of elements of the old command economy and by the government's fear of unpopularity among those disadvantaged by the reforms. It fears that the re-form process could falter, leading to stag-nation and continuing backwardness, a condition the report calls 'Sinosclerosis'. It therefore sets out in detail the further changes that need to be made if China is to continue to move forward. At the core of the programme is the government's withdrawal from direct involvement in the economy and the extending and deepening of markets. The government should disengage itself from the state enterprises and commercial banks; the report points to the growth of private enterprise over the last few years and sees China's future lying with private firms in industry and services. The government's current programme of concentrating on development of the largest state enter-prises is seen as no more than a step in the right direction; ownership of state enterprises should be diversified towards households and non-state institutions. Great emphasis is placed on the development of capital markets. The state should stop interfering with the lending decisions of the state's commercial banks. Using them to support state-owned enterprises is accumulating bad debts that threaten the stability of the banking system. The state banks must reinvent them-selves as commercial institutions with systems for risk evaluation and provision forbad debts. A strong banking system would be a key component of a system of flourishing capital markets comprising both primary and secondary equity markets and a corporate bond market with tradable bonds that could be used to finance infrastructure projects. All enterprises should be exposed fully to domestic and international competition, says the Bank. Open international trade in goods and services would encourage the spread of technology by providing the spur to Chinese enterprises to modernise themselves and provide the opportunity to do so by importing equipment from abroad. This would therefore also benefit China's main trading partners in the industrialised countries. China must also be integrated with the international financial system. This is al-ready happening, as the large 'errors and omissions' element in China's balance of payments statistics points to large private capital flows, some of them illegal, in and out of China. The government should therefore try to manage this for the benefit of the economy. Increased foreign investment, including portfolio investment, in China will lower the cost of capital and deepen domestic financial markets. Allowing foreign banks and financial institutions to compete in China would help Chinese banks to complete the transition to fully-fledged commercial institutions. In agriculture, the report recommends reducing the role of the state in grain procurement and storage as it is failing to achieve its objective of dampening price swings and buying a large part at prices below market prices is holding back farm incomes. Imports of grain should be allowed, to give Chinese agriculture competition and to control prices. What the report recommends is not less government, but a change of direction for government. In the economy the government's role should be transformed to support and regulation rather than control. A proper framework of laws and law enforcement is required that guarantees property rights and protects investors and consumers. The government must acquire the expertise to maintain macro-economic stability by indirect means, rather than administrative measures. Barriers to competition must be removed, says the Bank, particularly the barriers erected by provincial governments, and tax advantages in the special economic zones near the coast should be eliminated. The government will have a positive role in what the report calls 'priority areas', intervening in areas where the market is inadequate ?education, health, pensions, infrastructure development, and protection of the environment. These, too, play their part in promoting growth. Removing the burden of providing pensions, housing, health care and schooling from state enter-prises would assist their economic transformation, and encourage the development of a labour market as workers would no longer lose these benefits when they changed employers. The current pension system with its hotchpotch of imcompatible lo-cal schemes must be replaced by a national system. The World Bank proposes a three-pillar system, combining a minimum pension, similar to social security, with compulsory-funded occupational schemes and voluntary individual top-up pensions. All would be fully portable to encourage the mobility of labour while the pension funds would provide a new source of capital for investment. In 1995, 6.4 per cent of China's population was deemed elderly; the ratio of young supporting the elderly was 10:1. By 2020 the ratio will have slipped to 6:1 and 2050 to 3:1. Spending on-education will reduce illiteracy rates ?at around 20 per cent, about average relative to other countries ?and increase China's stock of skilled workers. The proportion of young people attending college should also be increased. Currently the mainland's rate is lower than in many other developing regions ?in 1994 only 2.4 per cent of the university age cohort was enrolled in higher education, compared with 10 per cent in Indonesia, 39 per cent in Taiwan and 51 per cent in South Korea. Higher standards of health would reduce the loss of production from illness and death. Protection of the environment would ensure that development was sustainable, improve health and encourage more effective use of resources. The World Bank estimates that 178,000 Chinese die prematurely each year because of high levels of pollution (see chart). In economic terms, 7.4m work years are lost because people are too ill to go to work. All these measures, combined with a minimum of direct action by government, would reduce China's remaining poverty and with it the risk of social unrest. To do these jobs properly, the government needs resources and it must restore and reshape its finances and avoid budgetary difficulties that impose strains on the financial sector. The effectiveness of tax collection should be improved, particularly for non-state enterprises, and compliance rates brought closer to the best rates in other developing countries. Foreign and domestic companies are recommended to pay the same rate of corporate income tax, and tax breaks for foreign investors be phased out. And, lastly, new taxes should be introduced that combine revenue and social objectives, such as pollution taxes and social security contributions. With these reforms in place, China will continue on its path to an agile, modem economy, the second largest trading nation in the world. It will have been transformed from a rural, agricultural economy to an urban industrial one, in which one-fifth of the world's population would have the power to break free of poverty and under-development.